A swarm is one of the most dramatic and amazing shows of nature that anyone, beekeeper or not, can witness. Swarming is a natural process through which honeybees reproduce and pass along genes to the next generation. Though often viewed as counter-productive for the beekeeper, if honey is the goal, it is in fact a sign that the colony is healthy and flourishing. Getting to the point where a swarm is necessary is costly for bees and weak colonies do not have the resources to cast swarms. A colony prepares to swarm when it is running out of room in the hive. when there is an abundance of food contained within the hive and when the colony has a high number of workers. It is then that the colony divides and casts a swarm after preparing and capping new queen cells (referred to as swarm cells). The beekeeper will find the swarm cells located along the bottom of frames in a Langstroth hive. The portion of the colony that leaves the hive will contain the queen and about half of the workers from the original colony. After leaving the hive, the bees will usually land nearby and form a cluster. It is this cluster that the casual observer often discovers as a swarm. The swarm can be located on anything from fire hydrants and light poles to benches and buildings, but is often found in trees where previous swarms have landed. The bees that form the cluster are engorged with honey and usually docile. The cluster contains numerous workers of prime wax-producing age (12 to 18 days) to prepare for drawing comb at the new location. After the cluster forms, scout bees search for a new home. When they return, they perform a dance on the cluster to communicate not only the direction of the new home but also details about the new residence itself. Just what are scout bees looking for in a new home? Research shows they are looking for a cavity approximately 1.5 cubic feet in size, give or take. Entrances of approximately one and a quarter inch are preferred. After a period of a few hours to a few days the bees decide which location appears to have the best qualities and the swarm leaves for its new home. Occasionally a new beekeeper might confuse a swarm with absconding. Under certain conditions, the entire colony will abandon its home. This is known as absconding and is distinct from swarming. When this happens, brood and honey stores are often left behind and no new queens are produced to maintain a colony at the original site. It’s not always known why a colony absconds, but it normally relates to disturbances, disease or mites, poor ventilation, animals (skunks, bears, etc) or a combination of things that contribute to making it an undesirable site. A beekeeper inspecting his/her hive will learn to recognize the signs of a colony preparing to swarm. Often a rapid buildup of the population is noted, including drones, and occurs about the same time as queen cups are constructed along the bottom of frames. 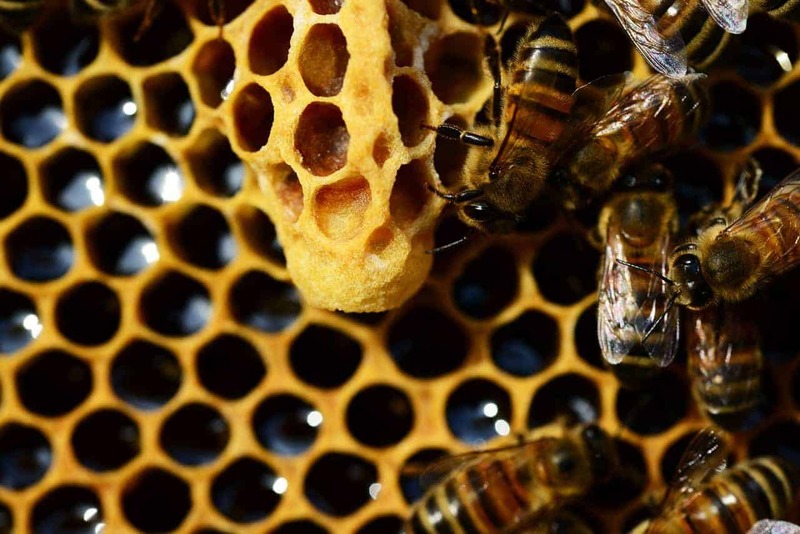 How does the queen prepare for a swarm? The brood nest will have become constricted as the colony runs out of room for both brood and honey. A little later the queen’s egg-laying tapers off and she reduces weight so she can fly. On the first calm and sunny day, after the new queen cells have been capped, the bees will assemble at the hive entrance and the swarm will be cast. Some beekeepers, under the guise of “natural beekeeping” allow their colonies to swarm simply because it is the natural thing for bees to do. Remember, a swarm is not a bad thing, in terms of nature and the survival of bees. Indeed, it is generally a “show of strength” and certainly a natural process. Allowing bees to swarm from colonies in the countryside is one thing, but it does present issues the urban beekeeper will want to keep in mind. The first thing to consider is that approximately just one in six swarms survive. If a person is trying to “help the bees” via backyard beekeeping, they may be better off to split the colony and increase to two hives. Second, with the increased interest in beekeeping, the number of colonies being kept within city limits grows every year. Neighbors of urban beekeepers are not always pleased to find a cloud of bees flying through their backyards and sometimes call authorities to complain about the swarms! Compounding the issue is where the swarm might make its new home. Bees searching for a place to set up housekeeping in town are likely to make their home in attics, walls, fireplaces or eves. Then the homeowner must pay for their removal and this again raises the likelihood of complaints and pressure from homeowners to shut down beekeeping in town. Beekeepers are usually some of the nicest people you will encounter and want to be known as good neighbors as well. We also want to continue keeping bees in town as the bees often do well there. Keeping swarms under control in urban settings will go a long way towards being good neighbors and continuing to keep bees in town. The time for swarm prevention is during your spring inspections. At this time you will want to provide additional room , as required, to make sure the colony does not get congested. You can do this by adding new frames (or bars in a top bar) to enlarge the brood chamber and provide more storage space for the growing colony. In a Langstroth hive, you can add an extra boxto create more space. You may also want to increase ventilation by opening your screened bottom board (just a bit, if night time temperatures remain cool) or propping up the inner cover slightly. Relieving the feeling of congestion by creating more space and improving ventilation will go a long way towards preventing the colony from swarming. Another manipulation that will assist the beekeeper in controlling the swarm impulse is reversing. Over the course of the winter, the colony and its queen tend to move upward through the hive. In the spring the beekeeper is likely to find his/her bees living in the upper hive body. The queen will be inclined to stay there and not move down, confining the brood space to the upper part of the hive. The reversing process is simple. Take an extra bottom board with you to the bee yard and place it next to the hive. If the hive is made up of three hive bodies, take the uppermost hive body and place it on the spare bottom board. Then remove the second hive body and place it on top of the first hive body you just placed on the spare bottom board. Now remove what was the bottom hive body of the original hive and place it on the top of the reversed hive bodies. You have just reversed the hive and created a lot more space while doing so. 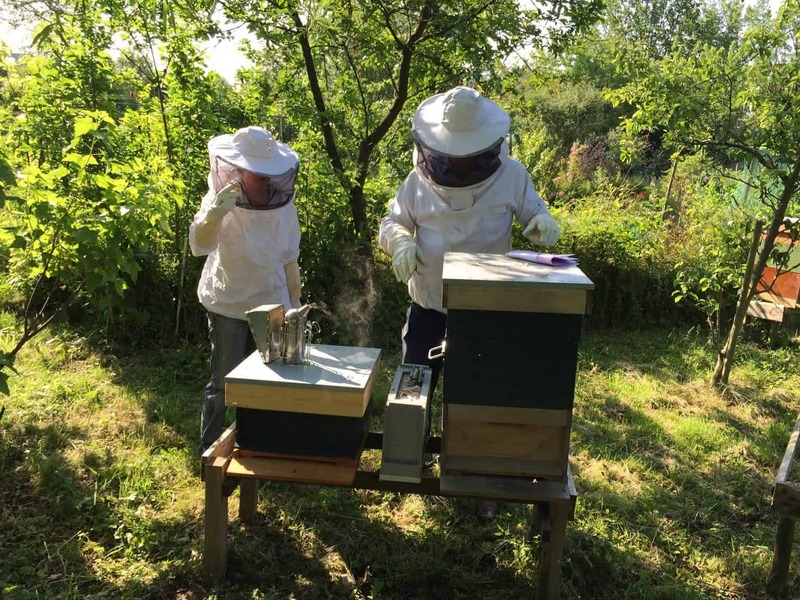 If the hive only comprises two boxes, simply reverse them by placing the top hive body onto the spare bottom board, followed by the bottom hive body. If you have more than one hive, clean off the bottom board left over from the first hive and move on to your next colony. If the colony is large and has filled out seven or eight frames in the bottom hive body, you can also “prime” the hive body above it by pulling a couple of frames of brood from the outside edges of the brood nest and moving them to the box above. You should only do this if temperatures are mild, as cold night-time temperatures will cause the bees to tightly cluster which may cause the nurse bees to abandon the brood you pulled up into the next box. That brood will then likely be lost in the cold temperatures. Sometimes a beekeeper won’t notice a colony is preparing to swarm until it’s too late. It happens to all of us at some point. 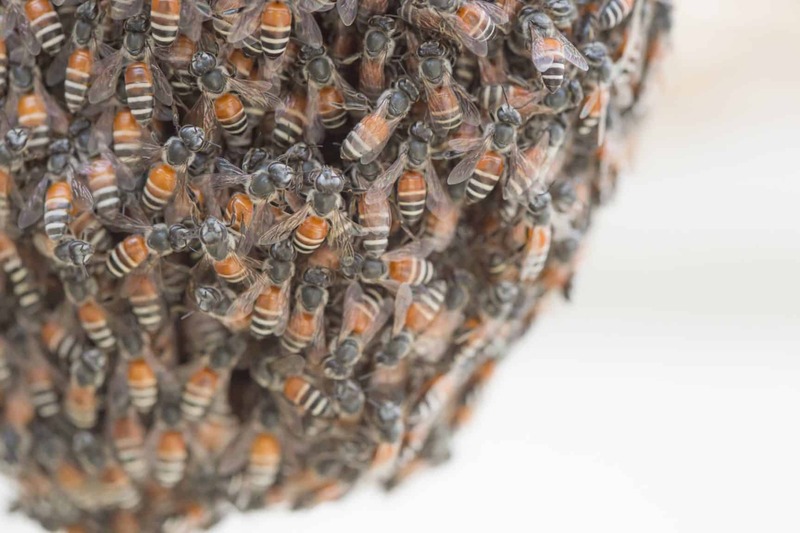 You will read in various places that removing the queen cells can help stop a colony from swarming, but once a colony has decided to swarm there is little a beekeeping can do. Find the queen, remove the frame (or comb in a top bar hive) she is on and place her in a new hive. Then add a frame of brood and a frame of stores to the new hive. Bingo! You now have a new hive, through a “split”. Depending on the age of the queen you may need to replace her at a later date, but for now, you have stopped the original hive from swarming. The colony will soon recognize that is is queenless. Later, when the new queens emerge, the colony will be more than happy to have a queen back in their midst and will not swarm. You, the beekeeper, have just prevented your colony from swarming and you’ve added a new colony to your apiary. It also provides a brood break, which helps to control mites. If you do not want the additional colony, there will always be plenty of folks happy to buy it from you. Just be sure to advise them that the new, smaller hive contains an older queen. It’s perfectly natural for bees to swarm and an amazing site to behold. However, the urban beekeeper will want to keep in mind the potential for nearby citizens to complain to authorities about ending beekeeping in town. An accomplished beekeeper will learn the skills necessary to prevent swarming, by increasing ventilation and making sure the colony does not become congested. Learning how to make a split is also useful for managing hives for swarm prevention and for making new hives. Swarming does not have to become a problem for the beekeeper and ultimately it is a sign of a very healthy colony. I had a hive that swarmed twice last year. Good information. Thank you for sharing that. What size of vent/entrance hole should I have in my Langstroth deep brood boxes?